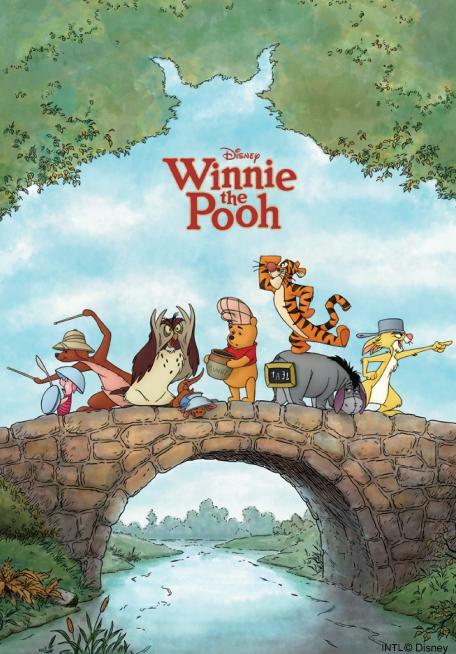 Winnie the Pooh and his friends from the Hundred-Acre Wood are back after a six-year hiatus. Sprung from the mind of English playwright A.A. Milne in the 1920s, the characters (based on stuffed toys owned by the author’s son) enjoyed new-found fame as the stars of full-length Disney features in the late 1960s and early ‘70s. The gang appeared on TV in various incarnations throughout the 80s and 90s—but it wasn’t until THE TIGGER MOVIE that the House of Mouse truly reinvested in them. PIGLET’S BIG MOVIE and POOH’S HEFFALUMP MOVIE brought more tender-hearted adventures about growing up and fitting in. Essentially a reboot of the fur-and-feather franchise, WINNIE THE POOH literally drops us back into the Milne book(s) about Christopher Robin's favorite playthings. It’s also a cinematic throwback. Unlike Disney's cutting-edge Pixar projects (UP, TOY STORY), the studio’s latest cartoon creation is 2-D, Rated G, hand-illustrated, and barely an hour long. Director Stephen Anderson (MEET THE ROBINSONS) artfully pastes familiar bits (Pooh’s quest for honey, Eeyore’s missing tail, an errant red balloon, etc.) from Milne’s source material into a cohesive new story about Christopher Robin’s disappearance and the enigmatic “Backson” creature which may be responsible. Narrator John Cleese occasionally interacts with our honey-hungry hero by shaking the book he’s ostensibly reading from. Later, Pooh catches on and uses the words to fashion a letter-ladder. The Henry Jackson / Robert Lopez score is appropriately buoyant and breezy (“Everything is Honey,” “Get Tiggerized”). Zooey Deschanel replaces Carly Simon in the comely songstress department, sweetening the animals’ mischief with melancholy measures (“A Very Important Thing to Do,” “So Long”). Sometimes a backwards step is the right one. POOH is a smartly-written, great-looking, less-is-more entry in an overcrowded (and noisy) kid’s market. Nostalgic parents—who recognize that Pooh’s very existence hinges on Christopher Robin’s imagination (and thus upon his arrested development)—might just get a lump-in-the-throat and dig up their old Loggins-Messina records. Because we know that “forever young” happens only in movies and song. Oh, bother! An animated short about a weepy, displaced Loch Ness Monster warms things up nicely. 3 out of 4 stars. My nine-year-old son just saw the new Pooh movie and wanted to comment on the film. So, here's his comment. The movie is all around horrible. Owl never stops talking, and he won't admit that he made a mistake. Kanga won't help the others at all. Tiny kids will be afraid of the so called "Baxson". And finally, Christopher Robin has the wrong accent. So there you have it. This is the Pooh that's poo. Thank you for sharing your son's thoughts, Stan. I'd say the little guy has a future in film criticism!